Réglage du pays juste assez proche de la ville !!! Les grands groupes sont les bienvenus !! Confortable et charmant dans une atmosphère de pays détendue. Nous sommes assez grands pour accueillir plusieurs familles et amis pour dormir et se divertir. Pratique pour toutes les principales attractions de la Dallas Ft. Worth zone. (Zoo de Dallas, Bishop Arts, Trinity Groves, centre-ville de Dallas, Ball Park à Arlington, Six Flags, stade des Cowboys de Dallas). Maison et jardins victoriens joliment décorés! Idéal pour un week-end, mariages, réunions et retraites. Un grand parking est disponible pour tous les invités. Douche à jets de corps, de beaux jardins, Fire Pit,.) Belle Creek à distance de marche, grands porches pour se détendre, Grounds peut accomoder de grandes fêtes en plein air. 2 Acres totale pour l'espace et les activités optimal. We rented during our son’s wedding. We had several friends and family all week during the days. It was very relaxing for our family. The house and grounds were clean, and well stocked for whatever we needed. The owners had dropped off some necessities before we arrived that were above and beyond the call. It was a great base for visiting and preparing for a wedding. We’ll be back when our family gathers again. This home was the perfect place for our family weekend together. The property was large, well groomed and had an at-home feel. We not only had a wonderful time in this lovely country home, but really appreciated the added detail of Loreen purchasing snack items that suited our family of five. She went above and beyond, which this day and age, is a rarity. 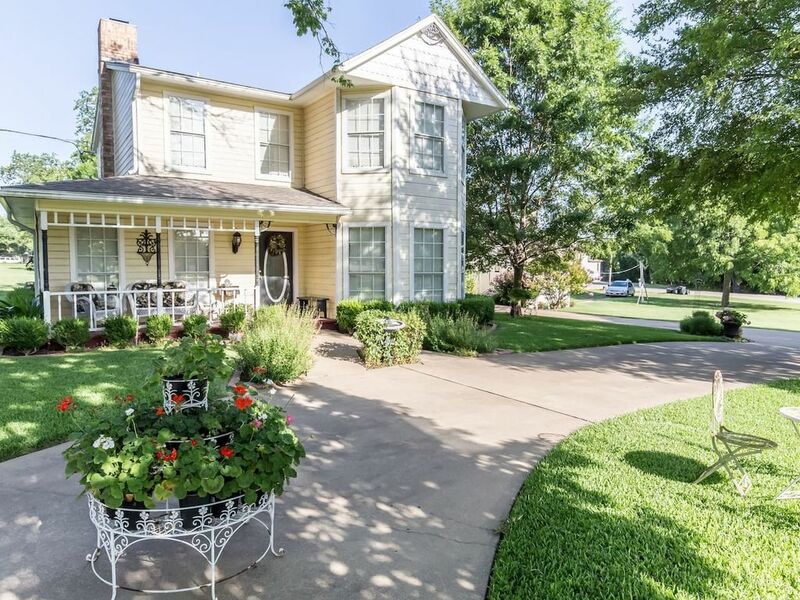 We were so grateful to have had the opportunity to stay here and certainly look forward to renting this gorgeous home again when we are back in the area! Laura, thank you so very much for the wonderful and kind words about your stay and our home! I am so glad that you and your family enjoyed your vacation. We look forward to hosting you all again. Thank you for taking great care of the property ! I loved staying in the house while we were in town for my son's wedding. We had lots of family travel from various states. This house was a perfect place for us to meet and enjoy each others company before and after the wedding. The yard is big, and very peaceful. I found myself outside one evening when everyone else was busy just sitting and relaxing and enjoying the sound of nature. Loreen was very helpful and answered any questions we had immediately. I would recommend this property if you are looking for a home away from home or needing a place for friends and family to gather and relax. The front porch was perfect for sipping tea and watching the birds. The beds were comfortable, the decorations adorable and the yard was beautiful. It was close to all the touristy things that we wanted to see, too. Thank you so very much for your kind words! It was such a pleasure to be able to host you and your friend. You were a delight from the first phone conversation to checkout. I would love to have you girls back again sometime! Loreen and her son Brett were fantastic, gracious hosts, who were able to accommodate our stay on very short notice. They greeted us at the property to check us in and give us the tour, and even provided some snacks and food staples -- finding a half-gallon of milk for our use was a welcome relief as we were traveling with a 2.5 year old, saved us a trip to the store. They also made sure we knew that they were available and responsive for the duration of our stay. My wife and I were travelling with our daughter to visit some relatives in the area, and this house ended up being perfect for us due to its layout. The upstairs has 2 smaller bedrooms (one of which we had our daughter sleeping in) and 1 master suite that has an attached living area on the far side with table, couch, and TV, as well as a full bath. It's convenient to be able to put the kid to sleep and retreat to that suite knowing that we won't wake her. We found the location a good balance of rural/quiet but also near to stores, restaurants, etc. We'd love to stay here again on our next visit to the area. Thank you so much Loreen and Brett! Thank you so very much for such kind words! We are so glad that you enjoyed your stay. I am glad that we were able to make you stay enjoyable. Looking forward to having you and your wonderful family stay again soon. Thank you for the great communication and cleanliness! A true example of charm and southern hospitality! My maid of honor and I stayed here over the first weekend of December for just a small girls getaway and we were awed at the incredible hospitality from Loreen and Brett! I have been looking at wedding venues for the past few months and this is definitely the place that fits all of my expectations! We had wanted to stay somewhere outside of Dallas but not far enough that we felt too distanced from the city. The location is perfect! Brett was there to answer any of our questions and was very attentive and paid attention to detail so well! We were greeted with a bottle of wine and cupcakes as well as a tea tray (I prefer tea over coffee and I had mentioned that in our previous conversation). The house is GORGEOUS and Is a wonderful place to relax and unwind at whether it's 2 people or 10 people. I am so excited to book with the Villas again, and hopefully for my wedding! I am speechless! I can not even begin to tell you how much I appreciate all of the wonderful things you have said. I am so very grateful to be able to share the property with others such as yourself. You are so sweet! I look forward to hosting you all again ! Situé à seulement 20 minutes de la scène alimentaire de Dallas à Bishop arts et de bosquets Trinity. Situé à seulement 25 minutes du centre-ville de Dallas. Un lecteur rapide au zoo de Dallas. Populaire Joe Pool Lake se trouve à 20 minutes en voiture où vous pouvez en bateau, ski, et le poisson. Ovilla est situé à seulement 15 minutes de Hutchins (majeur HUB de transport DFW) où l'Union Pacific Railroad appelle une de ses maisons, ainsi que de nombreuses autres sociétés de transport. Vous serez entouré par des cinémas, des magasins, et votre choix de restaurants dans les 10-15 minutes de toute direction Ovilla. Si vous êtes à la recherche pour se détendre, profiter de l'air pur et les étoiles lumineuses alors vous êtes dans l'endroit parfait à la Villa. Profitez d'un bon feu extérieur ou dans, jouer à des jeux et profiter de la compagnie dans cette très petite ville!